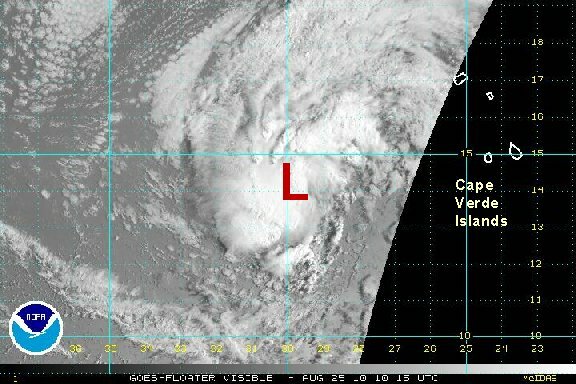 Enough spin and convection associated with a tropical disturbance west southwest of the Cape Verde islands is now present to classify this as the next depression. There is plenty of time to observe developing tropical depression 7. 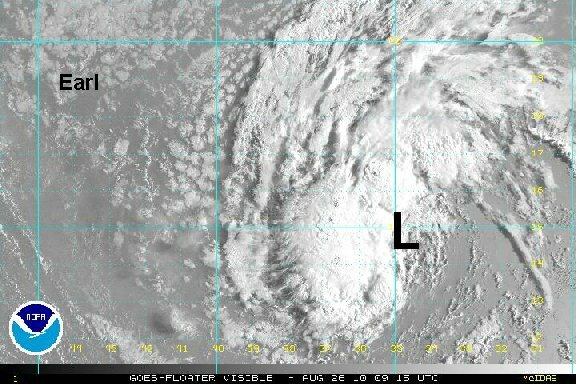 NHC will very likely classify this morning. 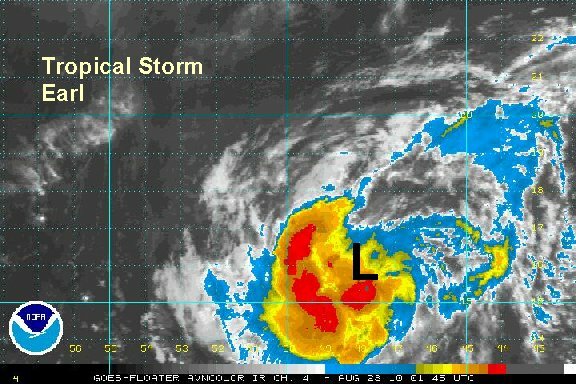 As of 7 am edt / ast unofficial tropical depression 7 was centered 14.0 N / 30.0 W or about 375 miles west southwest of the southern Cape Verde islands / over 2000 miles east southeast of the Leeward Islands. Top sustained winds are 30 mph. Movement is west at 10-15 mph. Early forecasts suggest that this system will closely follow Danielle's track over the next many days. There is a chance it will stay farther south as it moves northeast of the Leewards. It it too early to make a call on that. Tropical depression 7 now Earl? 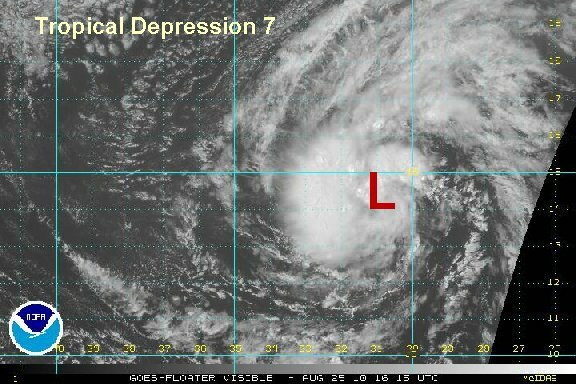 As expected, tropical depression 7 was classified by the hurricane center this morning. 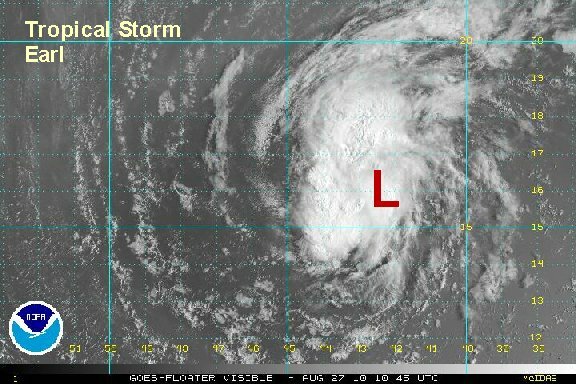 It has methodically organized today indicating that it appears now to be strong enough to be called tropical storm Earl. As of 2 pm edt / ast tropical depression 7 was centered near 14.3 N / 31.0 W or about 2000 miles east southeast of the Leeward Islands. Top sustained winds are 40 mph (35 mph nhc at 11am advisory). Movement is west northwest at 17 mph. Pressure estimated at 1004 mb. Deep convection is most impressive on the west side of the circulation, although the overall structure hasn't changed much. As of 9 pm edt / ast tropical storm Earl was centered near 14.8 N / 32.8 W or a little less than 2000 miles east southeast of the Leeward Islands. Top sustained winds are 40 mph (40 mph nhc at 5 pm advisory). Movement is west northwest at 17 mph. Pressure estimated at 1004 mb. Just like last evening, deep convection is most impressive on the west side of the circulation. The surface circulation is on the edge of the convection. Heavy showers and storms will need to built over top the low before any significant strengthening can occur. As of 6 am edt / ast tropical storm Earl was centered near 15.2 N / 34.8 W or a little less than 1750 miles east southeast of the Leeward Islands. Top sustained winds are 40 mph (45 mph nhc at 5 am advisory). Movement is west northwest at 16 mph. Pressure estimated at 1004 mb. Early forecasts suggest that this system will closely follow Danielle's track over the next many days. There is a chance it will stay farther south as it moves northeast of the Leewards. It it too early to make a call on that. 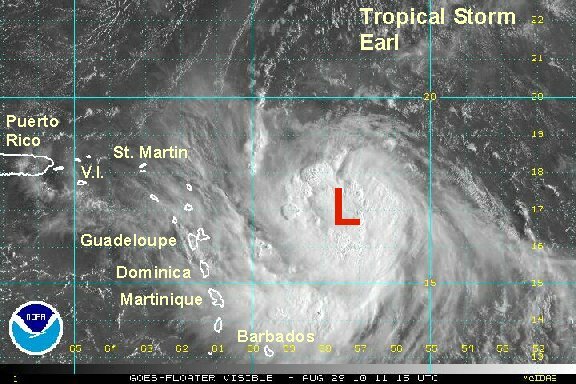 Forecasts have been taking Earl about 100-200 miles northeast of the Leewards. That is still in the margin of error for the Leewards to see some effects by early next week - very late Sunday or into Monday. 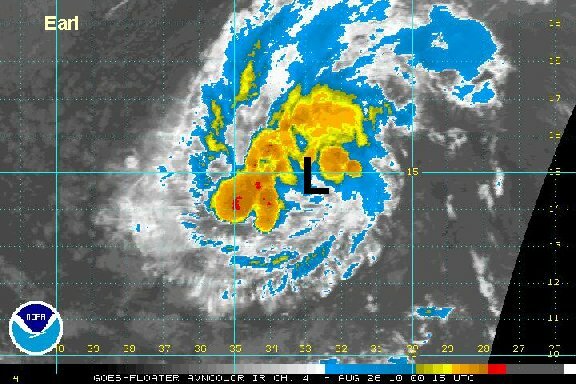 The low center is just starting to get under more convection allowing for Earl to strengthen some. We have been lagging NHC on wind speed by 5 mph until now. As of 2 pm edt / ast tropical storm Earl was centered near 15.1 N / 37.4 W or 1575 miles east southeast of the Leeward Islands. Top sustained winds are estimated at 45 mph (45 mph nhc at 11 am advisory). Movement is west northwest at 17 mph. Pressure estimated at 1004 mb. We are on the same page as the hurricane center on Earl...still getting better organized with no change in strength...yet. It looks like the deep convection is building, so the strengthening will begin shortly. As of 7 am edt / ast tropical storm Earl was centered near 15.8 N / 42.5 W or about 1200 miles east southeast of the Leeward Islands. Top sustained winds are estimated at 45 mph (45 mph nhc at 5 am advisory). Movement is west northwest at 17 mph. Pressure estimated at 1003 mb. Forecasts still suggest that this system will closely follow Danielle's track over the next several days. It will likely stay a little farther south. It will recurve about 100-150 miles northeast of the Leewards. That is close enough for the Leewards to experience some effects. They also show the path about 100-500 miles east of the Bahamas. It is too early to know how accurate this is yet. After this, they still suggest a turn to the north between Bermuda and the U.S. coast in the middle to late next week. Earl is still not stronger. In fact it looked more diffuse a few hours ago. Deep convection is starting to build again, so we'll stick with the 45 mph even though that may be a little strong. As of 3 pm edt / ast tropical storm Earl was centered near 15.7 N / 45.3 W or about 1050 miles east southeast of the Leeward Islands. Top sustained winds are estimated at 45 mph (45 mph nhc at 11 am advisory). Movement is west at 17 mph. Pressure estimated at 1003 mb. Forecasts still suggest that this system will closely follow Danielle's track over the next several days. It it staying a little farther south. It will recurve about 100 miles northeast of the Leewards. That is close enough for the Leewards to experience some effects. They also show the path about 100-500 miles east of the Bahamas. It is too early to know how accurate this is yet. After this, they still suggest a turn to the north between Bermuda and the U.S. coast in the middle to late next week. Interests in the Leewards, Bahamas, Turks and Caicos, and Bermuda should closely follow Earl. Interests on the U.S. east coast should monitor this system. Satellite imagery shows an increase in deep convection on the west side of the circulation. Because of this winds in Earl are upper a bit. As of 11 pm edt / ast tropical storm Earl was centered near 16.0 N / 47.9 W or about 1015 miles east southeast of the Leeward Islands. Top sustained winds are estimated at 50 mph (50 mph nhc at 11 pm advisory). Movement is west at 20 mph. Pressure estimated at 1002 mb. Similar to last night, convection associated with Earl is expanding slowly in areal coverage. We don't think that Earl is quite up to 60 mph yet, but close to it. 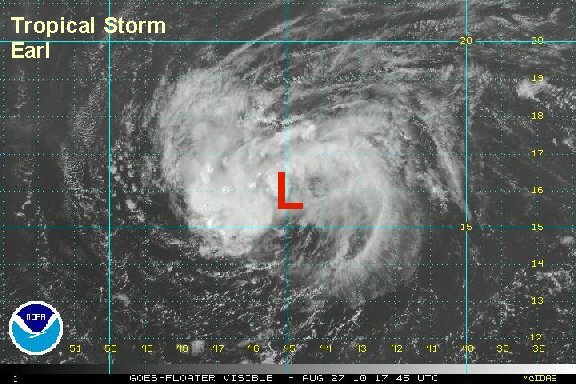 The outflow aloft looks improved so Earl is on its way to strengthening into a hurricane, possibly a major one in few days. 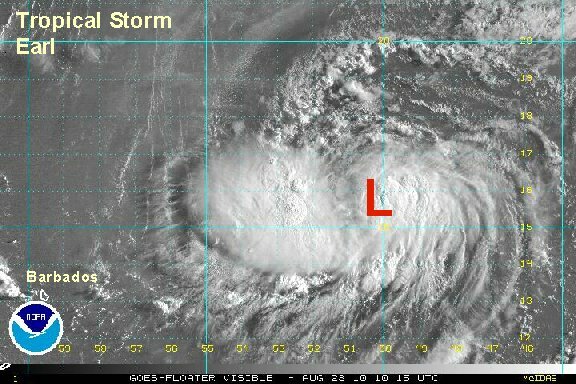 As of 7 am edt / ast tropical storm Earl was centered near 15.7 N / 50.3 W or about 730 miles east of Dominica / 855 miles east south east of St. Martin. Top sustained winds are estimated at 55 mph (60 mph nhc at 5 am advisory). Movement is west at 21 mph. Pressure estimated at 999 mb. Recent forecasts have shifted a little south. This means that by later Sunday into Monday Earl will be close to the Leewards. The range now is from the northern Leewards to about 100 miles northeast of the Leewards. In either case, the Leewards and possibly farther west in the northern Antilles and northern Windwards will see effects from Earl. Forecast models are still turning Earl east of the Bahamas, then northward between Bermuda and the U.S. coast in the middle to late next week. Interests in the Leewards, Virgin Islands, Puerto Rico, Bahamas, Turks and Caicos, and Bermuda should closely follow Earl. Interests on the U.S. east coast and northern Windwards should monitor this system. Residents in the Leewards should complete hurricane preparedness today. Deep convection has rapidly developed and Earl is on pace to be a hurricane within the next 6-12 hours. Heavy rain and gusty winds will start moving into the Leeward Islands during Sunday. 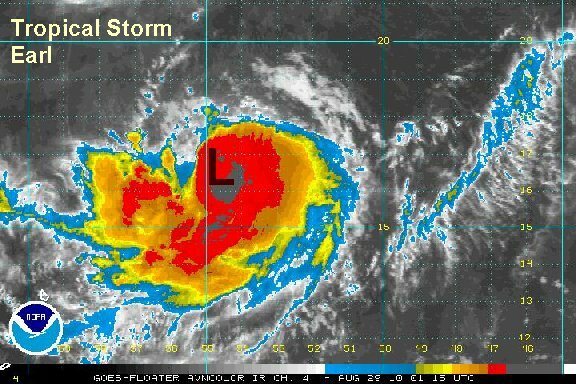 As of 10 pm edt / ast tropical storm Earl was centered near 16.5 N / 54.6 W or about 425 miles east of the northern Leewards. Top sustained winds are estimated at 65 mph (65 mph nhc at 8 pm advisory). Movement is west at 21 mph. Pressure estimated at 989 mb. Earl is predicted to by near the Leewards by late tomorrow into Monday. After this forecast models are turning Earl east of the Bahamas, then northward between Bermuda and the U.S. coast in the middle to late next week. Recently some models have taken Earl closer to the North Carolina coast by Wednesday and Thursday. We will watch this trend closely. Interests on the U.S. east coast and northern Windwards should monitor this system. Earl is still not quite a hurricane thankfully. It has a large cirulation and the effects of Earl will be spreading throughout the Leewards and south into the northern Windwards during the day today. Seas are in the 5-6 foot range near the Leewards, but 15-20 feet near the center of Earl. We are still expecting Earl to become a hurricane as it moves through the Leewards tonight into Monday. Several inches of rain with locally 5-10" are possible in the Leewards as Earl passes. Winds are expected to be tropical storm strength, especially in the northern Leewards. There is still a chance winds could be hurricane strength in the northern Leewards if Earl's track stays farther south than expected or if Earl is stronger than expected. We will watch this closely. 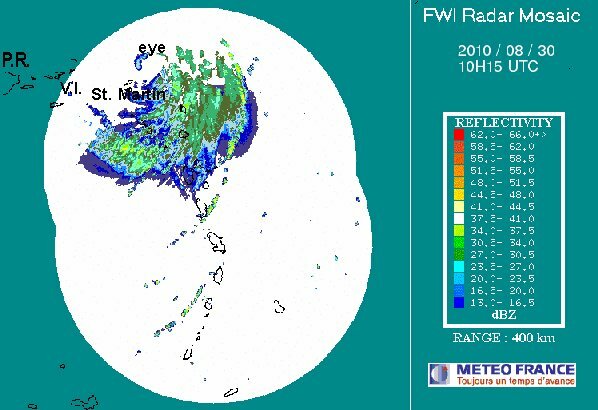 As of 7 am edt / ast tropical storm Earl was centered near 16.9 N / 57.3 W or about 385 miles east southeast of St. Martin / St. Maarten. Top sustained winds are estimated at 65 mph (65 mph nhc at 5 am advisory). Movement is west at 18 mph. Pressure estimated at 989 mb. Earl is predicted to by near the eastern Leewards by this evening and into the northern Leewards Monday. After this forecast models are turning Earl east of the Bahamas, then northward between Bermuda and the U.S. coast in the middle to late next week. Recently some models have taken Earl closer to the North Carolina coast by Wednesday and Thursday an offshore of Cape Cod by around Friday. We will watch this trend closely. Interests in the Leewards, northern Windwards, Virgin Islands, Puerto Rico, Bahamas, Turks and Caicos should closely follow Earl. Hurricane preparations should be completed in the Leewards asap. Interests on the U.S. east coast, Bermuda, and should monitor this system. 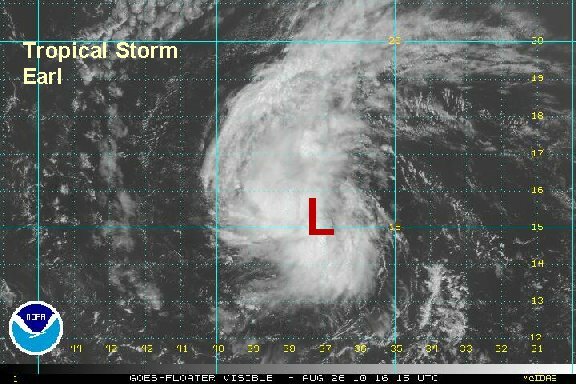 Satellite and hurricane hunter recon have confirmed that Earl is now a minimal hurricane. The motion is now west northwest which will take the eye just north of the northern Leewards. Anquilla and St. Martin / St. Maarten have the best chance of seeing part of the eyewall tomorrow. Several inches of rain with locally 5-10" are possible in the Leewards as Earl passes. Winds are expected to be tropical storm strength from Puerto Rico and through the Virgin Islands and Leewards. There is still a chance winds could be hurricane strength in the northern Leewards. We will watch this closely. As of 2 pm edt / ast hurricane Earl was centered near 17.4 N / 58.9 W or about 190 miles east of Antigua / 280 miles east of St. Martin / St. Maarten. Top sustained winds are estimated at 75 mph (75 mph nhc at 2 pm advisory). Movement is west northwest at 18 mph. Pressure 978 mb. Earl is predicted to be just north of the the northern Leewards Monday. After this forecast models are turning Earl east of the southern Bahamas by roughly 250 miles. It will be closest to the Turks and Caicos / southern Bahamas on Tuesday afternoon through Wedneday morning. It will then move northward between Bermuda and the U.S. coast in the middle to late next week. Models generally have been keeping Earl about 100-200 east of the Outer Banks and Cape Cod. This will be watched closely! Interests in the Leewards, northern Windwards, Virgin Islands, Puerto Rico, Bahamas, Turks and Caicos should closely follow Earl. Earl continues to slowly grow stronger. We are estimating Earl slightly weaker than the hurricane center's estimate of 85 mph. 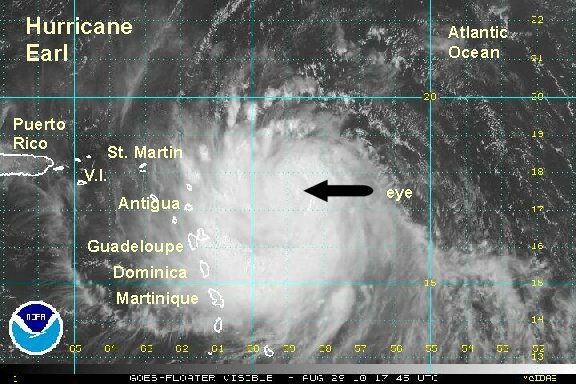 The eye of Earl will pass through or just north of the northern Leewards tonight into Monday. This will allow part of the eyewall to move into the extreme northern Leewards. A difference of 25 miles farther north could make the difference between hurricane force winds or not. Right now the strongest reported winds in the Leewards are about 20 mph. Some stronger gusts must be present in the one stronger band. 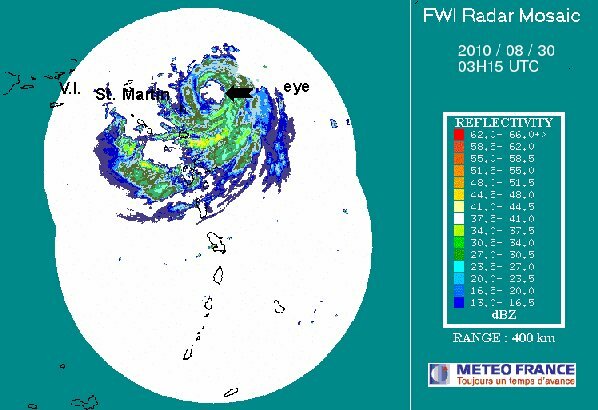 As of 8 pm edt / ast hurricane Earl was centered near 17.7 N / 60.3 W or about 100 miles east of Barbuda / 185 miles east of St. Martin / St. Maarten. Top sustained winds are estimated at 80 mph (85 mph nhc at 8 pm advisory). Movement is west northwest at 14 mph. Pressure 972 mb. Earl will be near the northern Leewards Monday. After this, forecast models are turning Earl east of the southern Bahamas by roughly 250 miles. It will be closest to the Turks and Caicos / southern Bahamas on Tuesday afternoon through Wedneday morning. It will then move northward between Bermuda and the U.S. coast in the middle to late next week. Models generally have been keeping Earl about 100-200 east of the Outer Banks and Cape Cod. A hurricane hunter recon recently reported a wind a little over 95 mph from the surface. NHC decided to go with an estimate of 100 mph since Earl is strengthening. Earl's eyewall is cooling rapidly indicating a strengthening phase which will likely take Earl into major hurricane status within the next 12 hours at this rate. Several inches of rain with locally 5-10" are possible in the Leewards as Earl passes. Winds are expected to be tropical storm strength from Puerto Rico and through the Virgin Islands and Leewards. 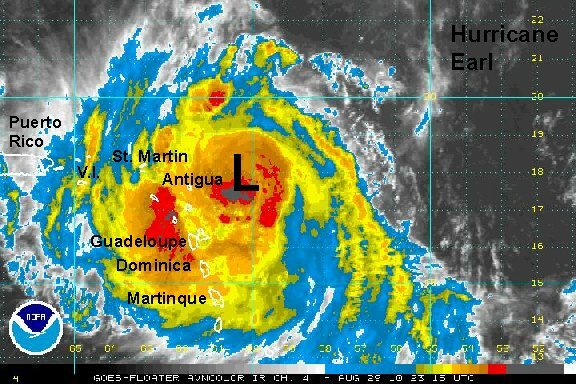 Hurricane force winds may be experienced in Antigua, Anguilla and St. Martin as Earl moves by. As of 11 pm edt / ast hurricane Earl was centered near 17.9 N / 61.1 W or about 50 miles east northeast of Barbuda / 130 miles east of St. Martin / St. Maarten. Top sustained winds are estimated at 95 mph (100 mph nhc at 11 pm advisory). Movement is west northwest at 15 mph. Pressure 971 mb. Earl is moving just north of the northern Leewards this morning. 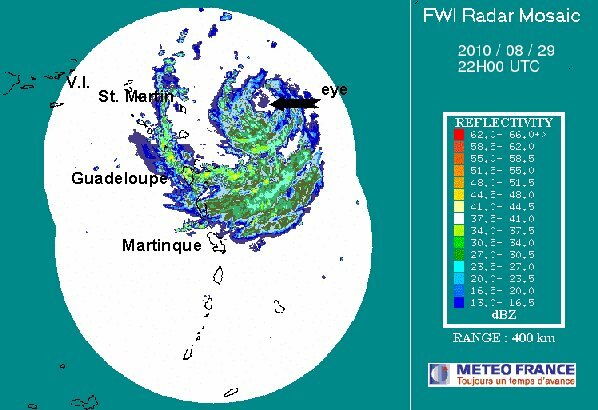 the strongest part of the eyewall is north of Anguilla at this time, but will likely wobble back into Anguilla / St. Martin over the next few hours as Earl passes. Hurricane force winds may be experienced. We continue to place the hurricane's strength estimate a little lower based on satellite imagery and pressure. Keep in mind that gusts can be 10-20% higher than the sustained winds. Interests in eastern North Carolina northward check the forecast below! 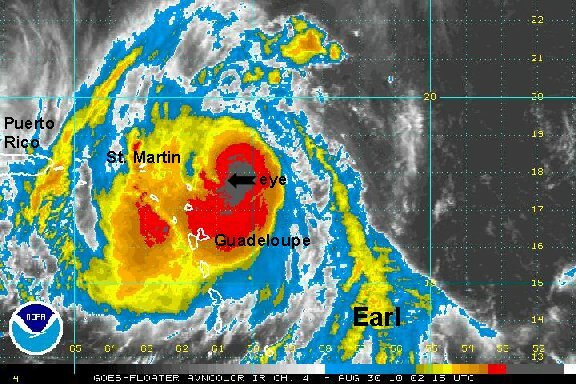 As of 6 am edt / ast hurricane Earl was centered near 18.4 N / 62.6 W or about 25 miles northeast of St. Martin - Anquilla / 155 miles east of St. Thomas. Top sustained winds are estimated at 100 mph (105 mph nhc at 5 am advisory). Movement is west northwest at 15 mph. Pressure 969 mb. 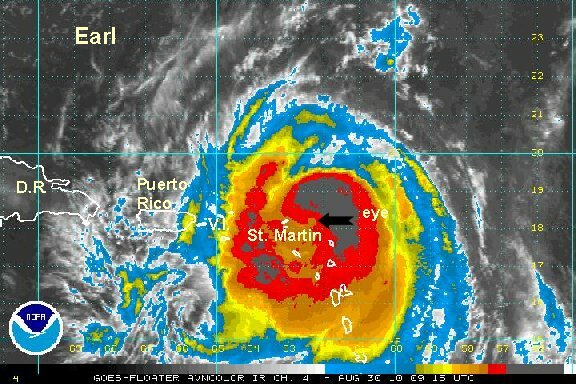 Interests in the Leewards, Virgin Islands, Puerto Rico, Bahamas, Turks and Caicos, and U.S. east coast should closely follow Earl.